I grew up on the east side of Cleveland, on the fringe of the Lake Erie snow belt. Every year I’d watch the snow storms sweep in, frigid and mighty, piling up snow and ice, menacing…think of advancing episodes of Game of Thrones! As a child, snow days were plentiful in northern Ohio. Remember the Blizzard of ’78? Ferocious 80 mph winds, mammoth drifts of snow and solid sheets of black ice set the stage for a winter drama of epic proportions. In recent years, our winters have not been nearly as brutal. But as I write this email on a cold, snowy January night, snow days aren’t on my mind. Instead, I’m reminded that winter’s long, brooding omnipresence is meant to have a spiritual effect on us, too. Symbolically, winter has appeared in many literary works, reminding us of the natural ebb and flow of cycles of hope, joy, sadness, and despair. In Shakespeare’s Richard III, the King forewarns: Now is the winter of our discontent/made glorious by this sun of York. Even if things are going well in our world (summer) this season won’t last forever. There will eventually come a bleak and barren period, a coldness, when events turn against us for a while (winter). The seasons of nature parallel the seasons of our soul and they have something to teach us. My church pastor, Keith Stuart, gave a timely sermon one recent chilly Sunday morning at Dover UCC in Westlake. He said: There are seasons in nature; there are seasons in our spiritual life. 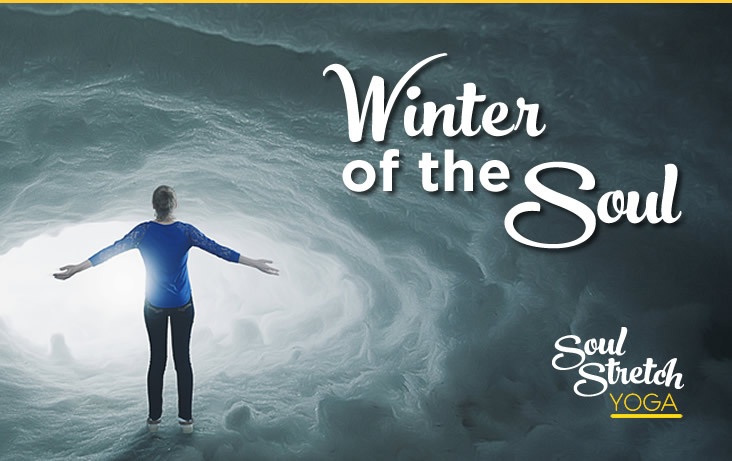 The winter of the soul shows up when you feel you have failed as a parent, when your marriage falls apart, when your doctor tells you the test was positive, when you lose your job….or the day the love of your life dies. Spiritual winter is that in-between time when you’ve lost something and you wonder if anything new can take it’s place. We feel as if God is distant from us, out of reach. As C.S. Lewis wrote after the death of his wife, “You go to God when your need is desperate and what do you find? A door slammed in your face…” Have you known that winter of the soul? I want to offer a few observations on how we might weather the winter of the soul. First, we can’t avoid it. We can’t organize our spiritual life in a way that we can be winter-free. There are those who believe if they are just clever enough or strong enough or positive enough or have enough faith, their spiritual life will be a perpetual summer. God reminds us that in this world, we will have tribulation. Third, you may not be in winter yourself, but you may know somebody who is. We often feel a need to say something when we see someone in pain. To fix it, find a reason for it. But it’s okay to say nothing, to just sit with the person. Community. Well said, Pastor Keith. Don’t be alone in this winter of your soul, Take advantage of community (say a yoga class) or be community for someone else.